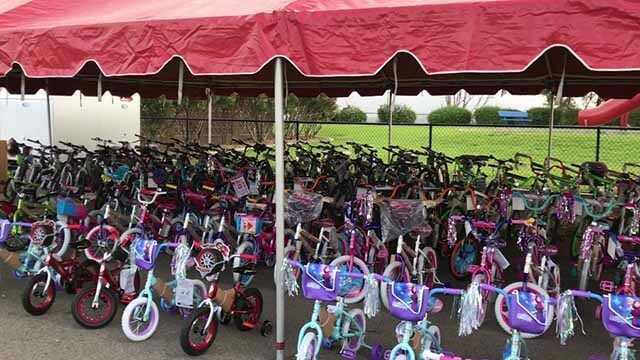 More than 1,000 families took part Wednesday in the Armed Forces YMCA’s 27th annual Military Family Holiday Toy Program, in which participants received a mini-Christmas tree, two toys per child and/or a bicycle. The program is designed to help military families who often struggle to make ends meet in high-cost San Diego. The program receives support from defense contractor Northrop Grumman, the David C. Copley Foundation, the Old Mission Beach Athletic Club, and Padres and Gulls sports teams, among other organizations. JMI Realty, HVAC contractor Jackson & Blanc and other partners also donated 700 turkeys for the event. Later Wednesday, nearly 80 children living at Father Joe’s Villages will ride in limousines to enjoy a holiday party at the DoubleTree Hotel in Little Italy that features food, games, crafts and gifts delivered by Santa Claus. The kids come from families that had been homeless. According to Father Joe’s Villages, the party gives children ages 5 to 17 a chance to celebrate the holiday season and get away from their families’ struggles for a little while.